Modelling balloons are used to create almost any given shape, balloon animals, birds etc to entertain kids. Our balloons are made from 100% rubber latex. Use bubbly balloon pump to inflate with air. 100% Italian made. 100% bio degradable. Certified for European Toy Safety Standards. Tested for hazardous substances at SGS TUV SAAR, Germany. 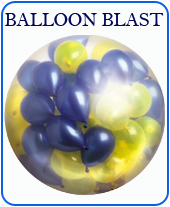 No doubt you are buying the best quality balloons. Important information: 100 pieces in a Bag. 2" Dia in size, Pastel Orange*, Volume 2.80 litres.